Excitement! I was thrilled that she would think of me for this project, and I’d been itching to write another story about my Bagram crew, so this was the perfect opportunity for me. Ace and Ryan are by far and away the Bagram Special Ops readers’ favorites. Ryan is just so alpha and sarcastic, and Ace is headstrong. They strike sparks off each other just by being in the same room. And then there’s Ace’s grandmother, who is closely modeled after my own dear late grandma. She was a hoot and a half, that one, so it was really fun to include more of her antics in this story. I wondered if it would be, but luckily I didn’t find it hard. 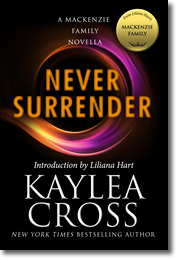 Declan MacKenzie is my favorite of Liliana’s characters, and because of his job, he fit right into the plot for Never Surrender. I enjoyed introducing him to my Bagram crew. Cobalt blue! It’s my favorite color; I find it both soothing and strong. Currently I’m working on book 3 of my DEA FAST series, Stand Fast. This one is set over in Afghanistan, where the DEA targets the flow of opium out of the country. It’s a high-stakes story with lots of intense action.